Janakpur Dham in Nepal is associated with Ramayana and it was the city of Raja Janak and Mata Sita. There are numerous holy places in Janakpur and thousands of Hindus arrive daily to have darshan of these religious sites. There is no dearth of Hindu temples in this ancient temple town. 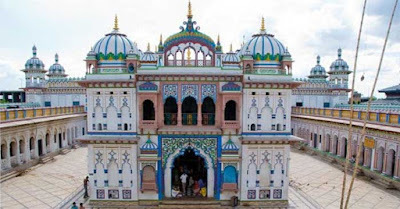 The most famous temple in Janakpur is the Janaki Mandir it is dedicated to Bhagavan Sri Ram, Mata Sita, and Lakshman. There are specially designated areas in the shrine known as Patti. Thus Ram Patti is the area where there is the temple of Bhagavan Sri Ram. In Sita Patti it is the temple of Mata Sita. There is also a Lakshman Patti. Janakpur Dham is spread over a large area – 15 km in all four directions. On the west side, the important shrines are Galeshwar Nath Mahadev and Mandeshwar Nath Mahadev. On the north side, the important shrines are Shireshwar Nath and Parvatheshwar Nath. On the east side, Singheshwar Nath and Maheshwar Nath Mahadev. On the south side, Kalyaneshwar Nath and Vishwanath Mahadev. Some of the ashrams of important Rishis in Hinduism too are located in the dham. in the south, it is the ashram of Vibhandaka Muni. 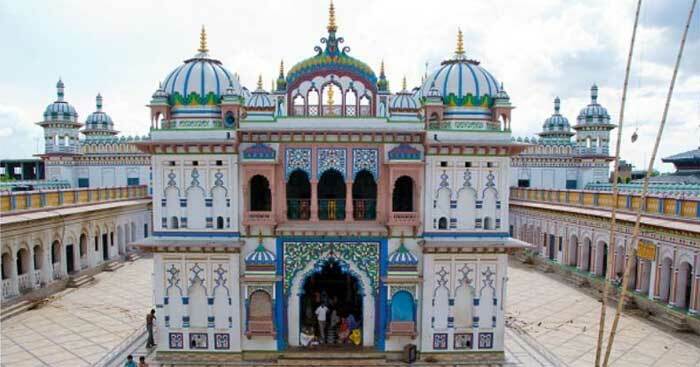 Legend has it that the Janaki Mandir was built by the ruler of Hikamgarh. The king did not have any children despite marrying three times. Once he visited Janakpur Dham and offered prayers for begetting children. Soon all the three queens of the king were blessed with a child each. As part of Thanksgiving, the king visited the temple with his queens and children. He then decided to build a grand temple here. The temple then cost 9 lakh – nau lakh. Thus temple is also known as nau lakh temple. The most important festival observed here is the Vivah Panchami in Agrahan month (Margashirsh month (November – December). This is the marriage festival of Mata Sita and Bhagavan Sri Ram. There is a popular belief that if couples offer prayer here soon after their marriage they will be blessed with healthy and intelligent children and peaceful and prosperous life. Upanayana and Mundan ceremonies too are observed here. The temple pond is known as Gangasagar. Legend has it that King Janaka prayed to Shiva for holy water to worship the Shiva Dhanush, it is said that Shiva poured water from the sky creating the Gangasagar pond.